One Mom's Moxie: SmartLab Toys - Weird & Wacky Contraption Lab, Review & Giveaway! SmartLab Toys - Weird & Wacky Contraption Lab, Review & Giveaway! My daughters are really into science and building things. I have posted before their other building creations so when I was given the opportunity to review a SmartLab Toys I was thrilled. I was given a few choices and it was a no-brainer for me to pick the Weird & Wacky Contraption Lab. My girls have had so much fun creating ways for the marble to reach the bottom, and I have loved watching them work together. You can see a quick clip of them here. I have to be honest our entire family has played with the Contraption Lab. It is so much fun to watch the marble go through all the parts and reach the end. This is truly a great toy and their website is full of other great products! I recommend joining the SmartLab Toys newsletter to keep informed of new products and specials. SmartLab Toys has been incredibly generous they are not only allowing me to giveaway a Weird & Wacky Contraption Lab but they are also giving all my readers a great discount! Save 25% at smartlabtoys.com by entering BLOGDEAL0313 at checkout! Make sure to check out SmartLab Toys Free Zone! Tons of free downloadable activities for kids, perfect for school breaks! 3D animal puzzles - my boy would LOVE it! My son would love the Blast Off Rocket Racer. The Squishy T-Rex looks very cool. The Squishy Human Body is cool! I like the All Natural Spa Lab and the Extreme Secret Formula Lab. kristiedonelson(at)gmail(dot)com Thank you. I like the science lab. I think that my son would love doing this and learning all at the same time!! 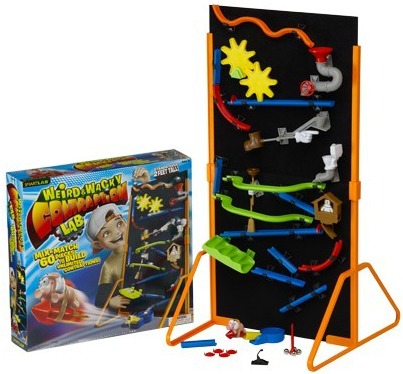 Weird & Wacky Contraption Lab is one I think everyone would like. My kids would love Science Lab kit! My daughter would love the Wallscapes Flower Garden! I like the Weird and Wacky Construction Lab. Thanks for this giveaway! The ReCon 6.0 Programmable Rover looks very cool! My daughters would love the Bug Playground!